Need Water Extraction? 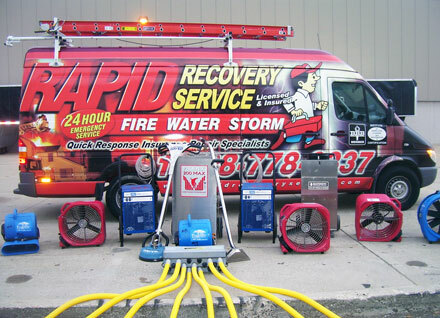 After examining the water damage to your home, Rapid Recovery Service will assemble an arsenal of drying tools and tactics including industrial fans, dehumidifiers, anti-microbial solutions and wet/dry vacuums for all types of water extraction. Our goal is to prevent loss and eliminate mold damage throughout the cleanup process. Our restoration team is dedicated to preserving the integrity of your home’s structure and we use professional equipment for all of your water cleanup and extraction needs! In the event of severe water damage, our team works quickly to repair and restore your home and its contents following a strategy designed to get your home back to normal with utmost care and follow-through. FLIR infra-red cameras are used whenever the situation dictates, to help locate hard to find water sources and help setup extraction methods.